I recently discovered tea fermentation and became fascinated with the idea of brewing Kombucha at home. Since we moved to Beijing almost three years ago, the fast pace of the big city life and the constant exposure to the noise, grime, and the general sensorial overload of this megacity had me craving a more balanced life style. Apart from physical exercise and mental fitness I wanted to also improve our diet. From a health perspective there are a variety of reasons why drinking fermented tea is good for you, especially to improve your digestive systems due to its naturally high concentration in enzymes and probiotics. It has cleansing and detoxifying properties that improve immunity and boost energy, since it is made with either black or green tea and contains beneficial amounts of caffeine. Kombucha is also a great source of natural antioxidants and contains medicinal amounts of alcohol occurring during the fermentation process. Besides, what intrigued me is the myth that the process of tea fermentation actually originated in China and dates back thousands of years. Some say a man called Kombu discovered how to make “cha”, which is the Chinese word for tea, into this health elixir, hence the name Kombucha. But no matter where it came from or who discovered it, today its widely accepted if not scientifically proven that fermented tea is good for you. So when a local start up recently offered a kombucha workshop at the Tech Temple fleamarket and advertised that each participant would get to take their scoby home I was in. The scoby is what makes sweetened tea into fermented tea, translating into “symbiotic culture of bacteria and yeast”. It looks like a sort of sponge, is firm to the touch, and smells somewhat like vinegar. The cultures feed on the substantial amounts of sugar that need to be stirred into the black or green tea and provide the energy necessary for the scoby to ferment the tea. This natural process produces small amounts of alcohol and carbonizes the drink, giving it a nice fizz, making it the perfect drink to substitute for fruit juices or sugary sodas. Any kind of sparkling beverages are a rarity in China, due to the fact that Chinese people are not particularly fond of drinking liquids with bubbles. Sparkling mineral water for example is quite expensive, and if you don’t fancy drinking coca cola every day you have a hard time finding a naturally sparkling drink. 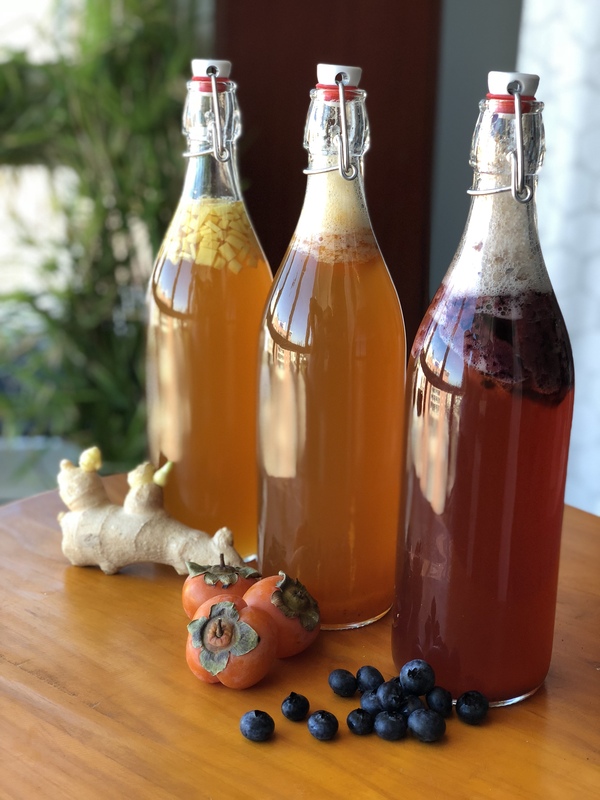 This made the prospect of brewing Kombucha at home even more alluring, since the second fermentation in the bottle like in the picture above infuses the ferment with quite a lot of fizz. I open the bottles daily to let out some of the pressure and to prevent the burst of the glass. Unfortunately, even that does not always guarantee the stability of the bottle, and last week I had my very first bottle of second fermentation Kombucha explode while I was at work. It was a nasty surprise coming home after a day in the office and finding the kitchen submerged in over a liter of sugary tea. Sugary tea covering our kitchen floor. Lesson learned, I went online and purchased round bottles instead of squares one in the hope that this would give the glass a higher degree of stability to withstand the carbonation pressure. I also scaled up my fermentation vessel, going from two liters to four liters, and added a scoby hotel to store excess scobys in the future. Currently our third batch of Kombucha is brewing in the dark cupboard under our oven and this morning we have opened all three second fermentation bottles to release the pressure. As seen in the top picture we added three different kinds of flavours, one with blueberry puree, one with mashed kaki, and a third one featuring sliced ginger. I expected the one with the ginger pieces to ferment slowest, but opening the bottles this morning we discovered that this one had already build up an astonishing amount of bubbles. During breakfast, we tasted the ginger version and were again surprised that although the kombucha sparkled a lot in the bottle, most of this fizz was lost when poured into glasses. We will let the remaining two bottles sit at room temperature for at least another day, opening them daily to prevent them from bursting, and will see soon enough if longer fermentation will increase the stability of the bubbles. Second fermentation with ginger flavour. To good health – Cheers! RITNB on Happy Chinese New Year! Stefanie on Happy Chinese New Year!